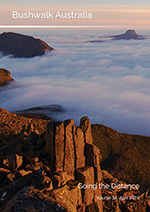 Subforums: NSW & ACT Trip Reports & Track Notes, Bushwalking NSW Inc.
Introduce yourself here. This forum is only available to registered members. Please test and experiment with forum posting features and behaviour here instead of in a live forum. Topics deleted after 5 idle days. Welcome to the online community for friendly and helpful discussion of topics of interest to bushwalkers and repository of bushwalking related information submitted by bushwalkers, for bushwalkers. Guests are welcome to browse, but are encouraged to register and then share their own information, opinions or advice, and to ask questions and get the answers needed. Registration is easy and free - just click the 'Register' link, above, then follow the instructions. Logged in users also see less advertising.